Actor Liev Schreiber Talks About His Upcoming Film Role As A Crossdresser! Androgyny is all the rage these days, as men seem to be having less and less trouble getting in touch with their feminine sides lately, but for actor Liev Schreiber, getting in touch with his feminine side means starting from the outside, in. The actor recently landed a role as a cross-dressing male in director Ang Lee's upcoming film Taking Woodstock, but it seems that Schrieber has been preparing for this role all his life. At a Monday night event at the Gates nightclub in New York to celebrate his cover story in Hamptons Magazine, the actor dished to New York Magazine that getting into character for the upcoming film wasn't his first time cross-dressing. "I've done it once before," Schreiber said. "I'd just gotten out of school the first time I did it. I was such an excited drama student back then that I did a ton of research that I guess I kind of borrowed from this time." This isn't the first time the actor has alluded to his fascination with playing "dress up." 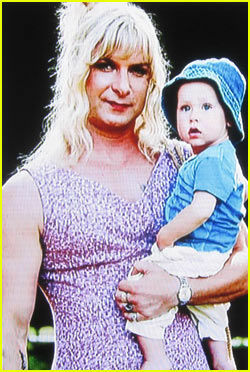 During a guest appearance on Late Night With David Letterman on May 5th, Schreiber shared a picture of himself dressed as a woman sporting platinum blonde hair holding onto his son Sasha, to the amusement of the audience.